Mole Monster begins his attack on New York City. However, he is shocked and puzzled to find that none of the city's superheroes are there to fight him. In response, Sam Alexander flies in to begin the fight the villain was looking for. The Mole Monster starts making personal insults about Sam's father and his own father the Mole Man. The distraction allows some of the attacker's creatures to blast Nova with a high energy weapon! Sam quickly gets back up and tells the Mole Monster he doesn't need any of Earth's other heroes to stop him. In a blur of motion, Nova blasts the Mole Monster's creature with multiple energy blasts! The barrage causes the creature to throw its master off its back. Unfortunately, the angry creature lashes out and begins a rampage through downtown New York City! Sam now realizes he could use some superhuman help. In a bar called Game Over, Nova comes crashing through the window and lands next to a man who doesn't seem surprised by his entrance. The bar patron asks Sam how old he is and seems mildly disgusted when he learns Nova is 15. He then asks Sam Alexander if he is a member of the Avengers and, if so, which group. The teen hero says he has to go fight a giant monster. The trenchcoated stranger tells Sam he'd be better off learning how to tune out being a hero like he finally did. Suddenly, the front of the bar explodes as it is hit by the Mole Monster's creature! The stranger finds his beer has been spilt and is now angry enough to fight the monster. The two heroes launch a furious attack on the rampaging monster! Nova blasts the green monster and is surprised to see that the stranger is strong enough to punch the creature and hurl a bus at it! The two connect their punches on the monster's head at the same time and it is powerful enough to make the creature fall. The stranger with superstrength finally introduces himself to Nova. He states he is the Captain. He also mentions he is a member of the former superhero group known as Nextwave. He informs Nova that he's not a superhero any longer and has no interest in returning to that life. He also advises Sam to get out of the hero business. That it is a life of being unappreciated and will leave him not trusting anyone except himself. Later, in Carefree, Arizona, Nova returns home and has a talk with his mother. 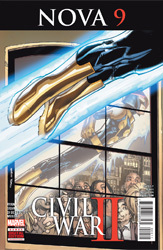 He tells her about his conversation with the Captain and reveals to her the existence of a new Inhuman who can see the future (the events from Civil War 2). With all the events happening lately and not being able to get in touch with the Avengers, the distraught teen admints that he's scared. However, he tells Eva that he does know what he plans to do next. He promises his mother that he will find out how the Nova Force works or he'll quit being Nova for good.